The flourishing popularity of Cannabidiol (CBD) as a holistic and natural pain remedy has helped give birth to a number of new industries. One such industry is CBD Coffee. For those who've known about these health benefits for a long time, the thought of combining CBD with every day consumables may be nothing new. But for everyone else, it's an amazing thing to be able to enjoy a gourmet coffee that's been pre-infused with CBD. 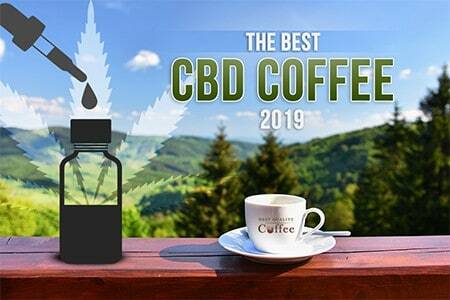 In this article on the best CBD coffee brands of 2019, we take a look at some tried and true options for those looking to explore the CBD coffee market. Not all CBD coffees are created equal. Coming from the perspective of a health-conscious coffee lover, there are two areas that matter most: the quality of the CBD used and the quality of the coffee beans. Let's briefly talk CBD first. CBD is a compound found in the cannabis or marijuana plant and has been proven to help relieve a wide range of ailments from physical pain and anxiety to Alzheimer's and cancer. It's important to note the difference between CBD and THC which is the psychoactive ingredient found in cannabis responsible for giving users the “high” feeling. Most of the coffees selected for this list use full-spectrum CBD which does not contain THC while some contain less than .3% of THC. There's a wealth of quality information available about CBD and its affects. We won't cover it all here but you check out this article for more information on CBD's health benefits. It goes without saying that it's best to only go with high-grade CBD that's lab tested and certifiably legitimate. If by some chance the product information doesn't include test results, don't be afraid to reach out to the company beforehand to get this information. Should they be reluctant to offer this information, it's probably best to find another brand. The process of making CBD coffee goes well beyond just adding a few drops of CBD to your morning brew. There's a meticulous process these beans undergo for proper infusion. Coffees release natural oils during the grinding and roasting process which act as carriers of the CBD. This chemical reaction is crucial to preserving the integrity of the coffee's flavor while making sure the CBD is fully absorbed into the final brew. It's for this reason, that CBD coffee always come in pre-ground. 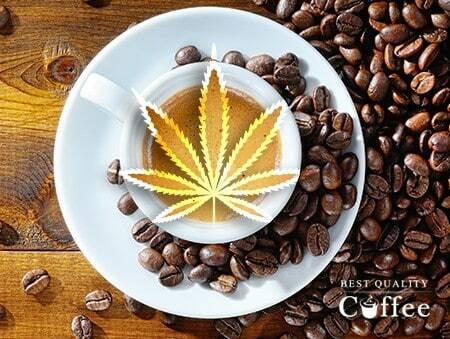 We'll be updating this list regularly as we test out new CBD coffee products. Please also note that all of these coffees do not require a prescription. These selected coffees are not listed in any particular order. Starting off this list is a company that's earned a stellar reputation in the CBD industry. Green Roads World offers a CBD Coffee that uses pharmaceutical-grade CBD. This CBD is formulated by a licensed compounding pharmacist so you can be sure you're getting the best product through and through. Each 8oz bag comes with 250mg of CBD. Green Roads CBD Coffee is made with delicious Colombian coffee beans as a medium roast. We were very impressed by the presence of flavor and subtle notes. For more information, check out our full Green Roads World CBD Coffee review. For those who own a Keurig or single serve brewer, NakedCBD offers a pharmaceutical grade CBD Coffee in the convenient form of a K-Cup. Each organic CBD coffee pod contains 10g of coffee and 10mg of CBD. We've taken an in-depth look into Naked CBD coffee and based on our experiences, have been extremely impressed with especially the effects of their CBD. Check out our full Naked CBD coffee review. While some other coffee's offer more CBD/pod, the quality and effectiveness of the CBD used here is exceptional. NakedCBD sources their beans from the high altitude of Colombia and yields a mellow acidity and a strong caramel sweetness. They offer full-flavored decaf as well. Next on our list is Baristas CBD Coffee. The company is based out of Seattle, the coffee capital of the U.S. and more importantly, a place where good coffee simply cannot be faked. They make a very high-quality brew and in our taste tests emerged as one of our top picks. In comparison to Green Roads World CBD Coffee, Baristas CBD Coffee is stronger and bolder. Their 2 oz bag of CBD Coffee is infused with 60mg of CBD. Fore more details about this product and brand, check out our full Baristas CBD Coffee review. 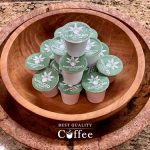 CBD Coffee lovers who prefer K-Cups and coffee pods are not without additional options. The appropriately named Chill CBD coffee pods contain 12g of a rich, strong artisan coffee and 25mg of third-party-tested CBD. Diamond CBD, the company that sells Chill CBD coffee pods, offers additional information about their third-party CBD testing procedures.